Welcome to our third newsletter. Among other things, we’d like to tell you about our new issue and invite you to celebrate its launch at The Arches bar in Glasgow. 1. Issue Five available now. can do so from the shop. 2. Issue Five launch event in Glasgow, Scotland. New Escapologist comes home to celebrate the most recent addition to the Escapological library. The launch event will be held on 10TH MAY 2011 at The Arches in Glasgow. All are welcome. Bring friends. Meet the creative team behind the magazine, mingle with other readers and buy a copy of the mag. Free entry, naturally. 3. What the readers say about Issue 5. “After I read it I wanted to scream their name from the rooftops. NEW ESCAPOLOGIST! It’s a magazine so good that I immediately went to their website, ordered every issue they’ve ever published AND subscribed.” – Nicolette, Mainz, Germany. Upon buying a second copy: “Although I’ve already ordered an issue 5 previously, I loved it so much I’m giving it to a friend.” – Mark, Leicester, UK. “The presentation is quite beautiful. I was expecting a magazine, but this is more of a collector’s item.” – Heather, Glasgow, UK. “It kept making me laugh out loud while waiting in the doctor’s office.” – Gwen, Birmingham, UK. The eternally-open New Escapologist reader survey is a gigantic ear, waiting to receive your opinions. New readers are thanked for completing the questionnaire. As ever, you can freely subscribe to our blog by RSS. You can also follow us on Twitter (@NewEscapologist) and there’s a Facebook group now too. Blimey, what have we become? Our handsome friend Rob has released an eBook called ‘Simplify’ on the subject of minimalism. It is for sale through iBooks and other channels, but Lulu are offering a 10% discount. The theme of the forthcoming issue is evolution; and will be titled À rebours after the inspiring and hilarious French novel by J.K. Huysmans. We’re aiming for an August release. The Wivenhoe bookshop in Essex are our latest stockist. They are a remarkable bookshop. Pop along if you’re in the area. Thank you again for reading. Enjoy Issue Five. White-collar: the sector concerned with semi-professional, administrative, or sales coordination tasks and endless games of computer solitaire. Employment in this sector leads principally to debt, early rises and the pinning of hopes upon the national lottery. Blue-collar: the sector concerned with manual labor. Though there are many noble circumstances for this flavour of work, it all too often comes down to sustaining two Capitalist continents of ungrateful and over-privileged skittles who can’t be successfully encouraged not to overfill a kettle. Green-collar: the brave sector charged with delaying the oncoming environmental collapse. Orange-collar: unpaid interns and reluctant volunteers. The term derives from the satsuma-orange shirt I wore for the duration of my school work experience. Detachable collar: the sector of society concerned with ‘detaching’ themselves from every flavour of grunt work and career ladder available. It also refers to the extremely practical, eminently stylish, decadent and bafflingly out-of-vogue detachable shirt collar. This is the kind of collar-work for readers of New Escapologist and possibly those of The Chap. Job? No thank you. I am self-employed and proud to be so. I come from a long line of self-employed people. We can trace our family tree all the way back to the family tree, and not one of us has ever been employed by, or employed, anyone other than ourselves. And my wife is self-employed too; I employ her on a self-employed basis. Not for us the numbing comfort of the regular wage, the possibility of a mortgage and tacit acceptance by mundane society. Ours is the ever-bracing wind of the free market, the exciting scrabble for patches of work, and the constant thieving. And then I found The New Escapologist. The New Escapologist! I read their blog and I ordered an issue of their magazine. That issue came in the mail, and after I read it I wanted to scream their name from the rooftops. THE NEW ESCAPOLOGIST! It’s a magazine so good that I immediately went to their website, ordered every issue they’ve ever published AND subscribed. I may not agree with every article (this month’s issue is about Bohemians, with whom I have my qualms), but every article is brilliantly written. That’s right, BRILLIANTLY. Intelligent writing, humor, and articles covering everything from beards to Bohemian escapology? Please excuse me while I retire to the powder room for a cold shower. Get your own copy of Issue 5 at the shop. I spotted a diet book recently called Mindful Eating, Mindful Life. It’s message is to maximise mindfulness while eating: to savour one’s food absolutely rather than gorging upon too-big quantities. The stomach needs time to register fullness, and so slower eating reduces overall consumption and prevents obesity. Slower eating is also a parable for general mindfulness: surely the key to enjoying life while it’s actually happening. Practicing this kind of restraint is a good idea, I reckon, but one I’ve been practicing for ages. I sometimes play a game called “the last piece of chocolate in the universe”. 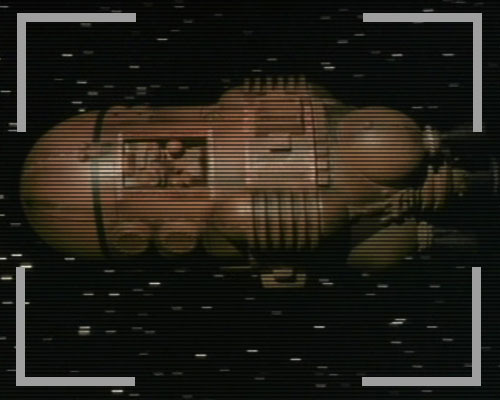 If I have a piece of chocolate, I sometimes imagine that I’m the last human alive, floating through space in an escape pod after the destruction of the Earth and last manned space station. I have limited food supplies and, in particular, I am down to the last piece of chocolate. Given that I’m the last human being alive, that I’m surely going to suffocate or starve in a matter of days, that the Earth is destroyed, and that the means of chocolate production will never be reestablished, this is probably the last piece of chocolate in the whole universe. I must savour it. And so, in the real world, I eat my chocolate, tiny piece by tiny piece, and savouring every last morsel. I truly have been doing this forever. I don’t know how it got started. I have a childhood memory of being in a long-distance car ride with my family. My mum had brought a sack of chocolate-coated raisins along for the journey. I played ‘the last chocolate coated raisin’ game and made a single raisin last for about five minutes. “Okay, I think you’ve had those for long enough”, said my mum from the back seat and took the raisins back. I protested and said that I’d not even finished my first raisin yet, but she wouldn’t believe me. So I’ve been savouring for ages. In fact, I am practically a skeleton, so it must work. Try it this Easter, egg lovers. See if you can make a single chocolate egg last until next Good Friday. (Actually, that’s a bit extreme. Just see if you can make one last the weekend). One of our lovely contributing editors, Mr. Reggie Chamblerlain-King, is releasing some additional Bohemian content onto his blog. We were originally going to publish these pieces in Issue 5 of the magazine but – in our longest issue to date – something had to give. These bonus pieces concern Bohemian-themed musical numbers. If this floats your boat, keep an eye on Reggie’s site for updates. Organisations found they could get rid of people, but not get rid of work. And because you had to work, you just felt lucky to have a job. And if you wanted to get promoted, you had to be there. The November 2010 issue of a glossy magazine called Fashion was on the table in our dentist’s waiting room. It contained a weirdly good article about how we work too hard and why. The article doesn’t seem to exist online so we scanned it. An Escapologist’s Diary. Part 24. This week, Samara and I visited the Free Hetherington – Britain’s longest-running student occupation – ostensibly to hear an address by comedian Josie Long. Josie was great, but the main impression I was left with was one of respect for the merry band of passionate students responsible for the Free Hetherington. You may have seen the initiative in the news. Basically, the Hetherington used to be a university-run watering hole and social space for postgraduate students and staff. University bean counters closed it down last year with the intention of turning it into offices. There was a collective sigh of frustration and some brilliant young students decided to do something about it. The club was actually a bequest for the students of Glasgow University; and so the students rightfully and skilfully took occupation of it. I think the official occupation has come to an end but the students are still there, running the day-to-day business of the club, and generally running a nice space for socialising and study. They also support industrial action on behalf of university staff and are, needless to say, highly vocal about the evil of the public sector cuts. 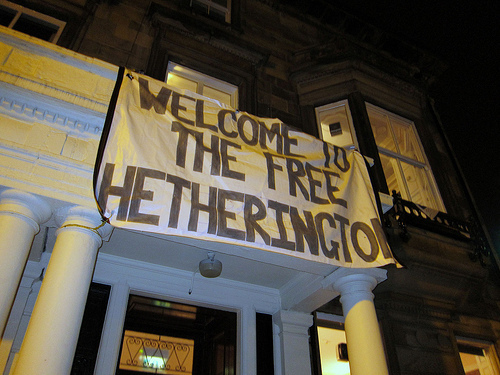 I don’t know why it took me so long to visit the Free Hetherington. It’s bloody brilliant. The people there are warm and friendly, the club seems to run purely on the power of donations of time, money and supplies (which appear to have been abundant). There’s a free lending library and some rousing, witty and sincere Anarchist slogans about the walls. It’s an especially amazing victory to those of us who remember the club when it was a university-run membership-only affair. I used to frequent the original Hetherington Research Club back when I was an employee of the university library. I enjoyed a few nights of upstairs party decadence and even more nights of cozy downstairs chat with academics and PhD candidates. Some great memories. But I also remember the unnecessary stuffiness of the place and the rather harsh rules about membership (you had to pay for an annual subscription and you’d be given your key to the door, the lock of which was changed annually). On one occasion at the former Hetherington, I was asked rather pressingly to produce my membership card at the bar. I had it with me, but couldn’t retrieve it quickly enough to satisfy the irritable person at the bar. I fumbled around in my wallet in a kind of panic and even after producing it, she seemed barely satisfied. I decided not to order a drink after all and left the premises in protest, taking my party of friends with me. An unpleasant atmosphere had been created unnecessarily and I didn’t want it to be the backdrop for our leisurely pint. This week’s experience at the Free Hetherington couldn’t have been more different: I was actually encouraged to go behind the bar and help myself freely to the freshly brewed coffee. It felt quite naughty (and perfectly liberating) to walk on such previously-hallowed ground, akin to shouting ‘God is dead’ in a desanctified church. The club seems better run under the current student regime and it’s great to see messages of support coming in from people like Ms Long and even such luminaries as Liz Lochhead. Just wonderful. And a real case of people standing up for what’s right. 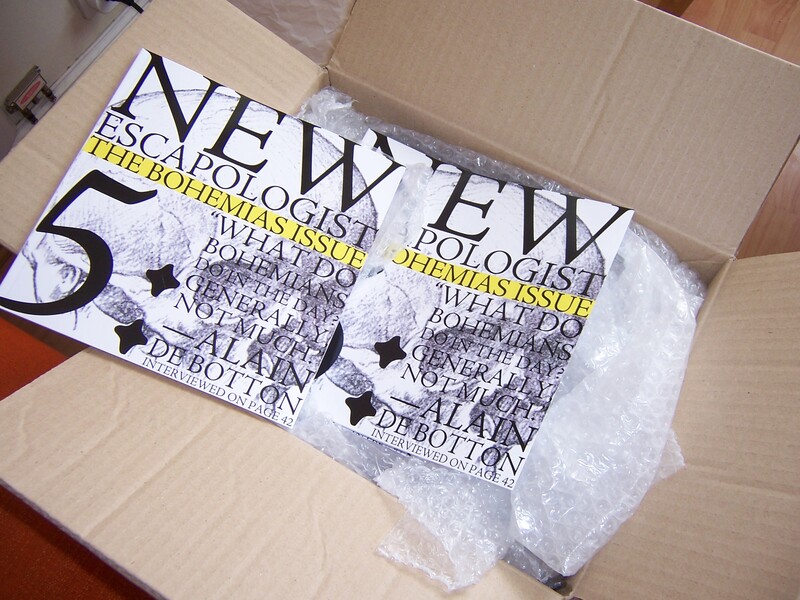 Issue 5 has arrived at New Escapologist HQ. It looks utterly fantastic. Rejoice! I’ll spend tomorrow stuffing and addressing envelopes and will ship them to readers on Saturday. They’ll be in the hands of UK readers in the early part of next week and International readers a little later. If you’re yet to buy a copy, order one here. This book is the result of a laziness like no other. I’m as ambitious as anyone else when it comes to life, love or money; but above all else I treasure those moments when I can sit on the couch and eat Jaffa Cakes without a care in the world. I’m a lazy man with ideas above his station. If there’s a simple way of doing something, I will know about it. My doppelgänger Rob used to work in an office until he decided to escape. Inspired by Judith Levine to stop buying anything inedible, he managed to save enough money to finance a Tim Ferris-style mini-retirement, during which he built a modest freelance operation around himself and never went back to the office. But before all of that, while still stuck at his desk, he wrote an entire book called Simplify, aiming to excite other people about his love of minimalism. It contains such nuggets of perhaps-not-revolutionary wisdom as “do one thing at a time” but also quite bold suggestions like “embrace Nihlism”. He also references New Escapologist heroes like Dickon Edwards and Tom Hodgkinson. The practical implications of a tidy, minimized wallet are that it becomes easier to use and that there’s far less hassle involved the next time you lose it. There is also a symbolic implication: you can either carry around a leather-bound mess every day or a pouch of calm simplicity. Carry your simple wallet with pride. Astonish shop assistants and muggers with your pocket asceticism. Also intriguing and funny is the method in which it was written: Rob wrote an entire book as a form of procrastination. While his colleagues were gawping out of the window or playing the games that come with Microsoft Windows, Rob used his procrasto-time to write a book. He wrote it chapter by chapter, emailing a chapter from the office to his home email account every day. Fifty chapters. Fifty days. It makes me wonder what else could be achieved in fifty days by doing it bit by bit? Three years later, Rob is selling his book in eBook form (designed by New Escapologist typographer, Tim) through Lulu.com. If you’re interested in minimalism, or just curious to see the creative result of an office drone’s procrastination, you can buy it here.